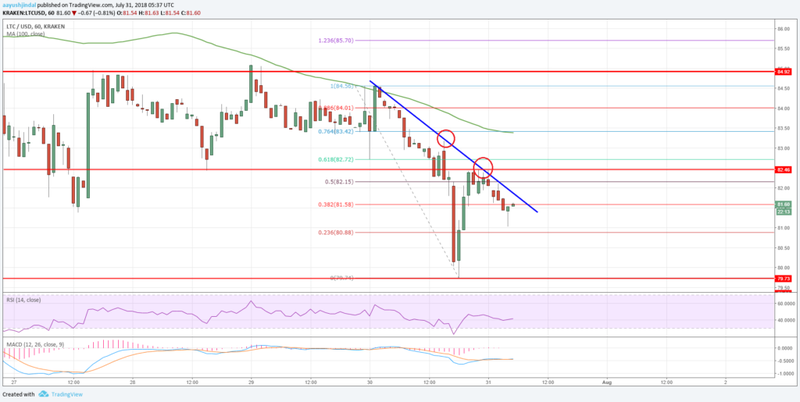 Litecoin Price Analysis: Can LTC/USD Hold The $80 Support? Litecoin price failed to recover and declined below $82.50 against the US Dollar. LTC/USD must stay above the $80.00 support to avoid further slides. Litecoin price traded further lower and broke a key support at $82.50 (Data feed of Kraken) against the US Dollar. There is a key connecting bearish trend line in place with resistance near $82.00 on the hourly chart of the LTC/USD pair. The pair is facing a couple of crucial resistances like $82.00, $82.50, $84.50 and $85.00. There was no upward move in litecoin price above the $85.00 resistance level against the US dollar. The LTC/USD pair slowly moved down and broke the $83.00 and $82.50 support levels. Looking at the chart, the price declined and traded towards a crucial support at $80.00 and settled below the 100 hourly simple moving average. The price traded as low as $79.74 and later started an upward correction. It moved above the 38.2% Fib retracement level of the last decline from the $84.56 high to $79.74 low. However, the upside move was capped by the previous support at $82.50. Moreover, there is a key connecting bearish trend line in place with resistance near $82.00 on the hourly chart of the LTC/USD pair. The trend line and the 50% Fib retracement level of the last decline from the $84.56 high to $79.74 low also acted as a key hurdle. The price is currently under pressure and is declining towards the $81.00 level. On the downside, the $80.00 support zone is very important. A close below this could accelerate declines in litecoin towards the $75.00 level. On the other hand, the price has to move above the trend line and the $82.50 resistance to start a recovery. The next resistance is at $83.50 and the 100 hourly SMA. However, the most important resistance is near the $84.50 and $85.00 levels. As long as litecoin price is below these, it remains at a risk of more declines below $80.00. The post Litecoin Price Analysis: Can LTC/USD Hold The $80 Support? appeared first on Ethereum World News.